Few can resist American-style pancakes, so Shrove Tuesday (24 February) is a good excuse to make a stack of these! They are as light as air and served with bananas coated in a sticky maple and lime sauce. For a change, try small, extra sweet bananitos, a seasonal, speciality banana. Sift the flour, baking powder and salt into a large bowl and make a well in the centre. Whisk together 1 pot of soured cream, the eggs and 3-4 tablespoons of cold water in a jug. Then gradually pour this mixture into the flour and whisk to make a smooth, fairly thick batter. Melt a knob of butter in a large non-stick frying pan over a medium heat until foaming. Spoon 3 large tablespoons of batter into the pan, allowing space for each pancake to spread. Cook for about 1 minute until bubbles appear on the surface of the pancakes, then turn them with a spatula or fish slice and cook for another 45 seconds until golden and puffed up. Transfer to a plate and keep warm. Repeat with the remaining batter and a little more butter to make 16 pancakes. When all the pancakes are cooked, return the pan to the heat and add the remaining butter and the maple syrup. Melt together over a gentle heat. Peel and thickly slice the bananitos or bananas, then add them to the pan. Increase the heat and swirl the fruit in the buttery syrup until it begins to sizzle. Remove from the heat and squeeze in the juice of 1 lime. 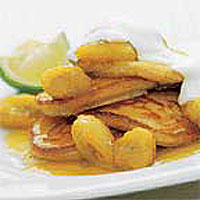 Serve the pancakes in stacks with the banana mixture and remaining soured cream spooned on top. Cut the remaining lime into wedges to squeeze over the pancakes just before eating. Use Rowse Pure Canadian Maple Butter in place of the maple syrup and butter. Or simply spread the hot pancakes with maple butter for a teatime snack.